The anti-laboratory does the opposite of invisibility research: making the invisible visible. This is what microscopy has done since the early 17th century when people were peeking for the first time into the strange world of the microscopically small, seeing the cells of plants with their own eyes, as well as the grotesque creatures of the small - fleas and lice being most popular in those days. Microscopy was essential in discovering what germs are - and what to do about them. Microscopy has done wonders, but it turned out to suffer from a fundamental limitation discovered around 1870. No matter what the magnification of the microscope is, one cannot resolve details much smaller than the wavelength of light; they become blurred. So in order to see extremely small things one has to use light of extremely small wavelength - which is difficult, or to use electron waves that naturally have small wavelengths instead of light waves, i.e. electron microscopy. Yet people have invented ingenious ways around the resolution limit of optics, see for example the material to the Nobel Prize of Chemistry 2014. The research on invisibility also began as research on perfect "negatively-refracting" lenses that do not suffer from the resolution limit. Such negative lenses did not turn out to be practical, but maybe other, more positive ones are ... This is what the anti-laboratory explores. Bureaucracy is a good analogy for black holes, but the event horizon of a black hole can be visualized by a “fishy analogy” as well, see the figure. Imagine fish in a river, swimming upstream with a maximal velocity c. Suppose the river is getting faster and faster. 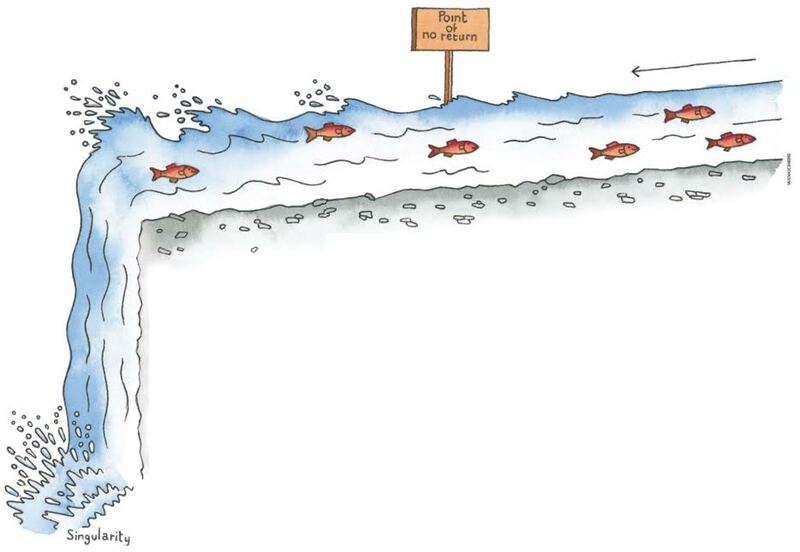 Where its velocity exceeds c the fish are doomed; they drift backwards until they are crushed at “Singularity Falls”. The point where the river reaches the speed of the fish is a point of no return, a horizon. In order to turn this analogy into science, all we need to do is replace the fish by waves, for example light waves, and the water by a general moving medium; the equation describing waves in moving media is exactly the same as the equation of waves in a space-time geometry that can create horizons. We (and others) are using this idea to create analogues of the event horizon and to probe the quantum physics at the event horizon. Is light made of waves or particles? And why should we care? To tell the difference between waves and particles is not so easy, with normal light coming from lamps, LEDs or the Sun, because this light is what is called "incoherent". The light coming from lasers, however, is coherent and really behaves like a wave. With laser light in a room you see strange speckle patterns on the walls. They are a byproduct of the most important property of waves called interference or the superposition principle. The principle simply means that waves add up. However, one wave may just have a positive and the other a negative amplitude, so adding the two up may give zero. Light plus light may give darkness, depending on how the light waves oscillate. You may also get more light than the sum of the two intensities. So what has this to do with the strange patterns of laser light in a room? If the light strikes the wall it is scattered - reflected. However, the wall is not flat like the surface of a mirror, but rough, and so the amplitude of the light gets scrambled. When the scattered light interferes with itself it gets brighter and darker at random patterns - the speckles you see. Natural light or light coming from ordinary lamps shows its wave nature in much more subtle ways. Incoherent light consists of myriads of wave trains - short pieces of waves following each other at random, but these pieces of waves can still interfere. The bright colours of insects, for example, are made by interference. The shells of insects or the scales on butterfly wings are made of layers. Each layer reflects some light, and the sum of all the reflected light is the light you see. It depends on the colour of the incident light - on its oscillation frequency - whether the total reflected lights gets enhanced or suppressed when all the reflections get added up. Some colours shine very brightly, some not at all, which gives the insects their characteristic colours. A fascinating example of natural colours - and invisibility - is the sea sapphire, a tiny copepod called Sapphirina Metallina. It uses optical tricks that are on par with modern nanophotonics or even better. The creature can change the distance between the reflecting layers such that it changes colour, from bright sapphire blue to invisibility. You have seen the multidimensional worlds in the museum. Is it possible to confine light on a two-dimensional sheet? Even if some light source on the sheet emits light, would it not go anywhere? Well, that depends. There is a whole discipline of optics called integrated photonics where light is confined to sheets - to chips actually, similar to electronic chips. For example, one can confine light in a thin layer, typically made of silicon on top of a glass substrate. Silicon is more optically brilliant than diamond, yet not for visible light but for the infrared. The light bounces within the layer, but cannot get out. It propagates in its own two-dimensional world on the chip. It may still feel the third dimension, however. The light sticks out of the silicon layer, both in the substrate and above the layer. If the layer gets thicker on some region of the chip, the light experiences more of the silicon and gets slower. With this trick one can build optical instruments on the chip for manipulating light - something we have done in our lab. Another example for confining light is fiber optics. In an optical fiber, light is confined to the fiber core; it can propagate in only one dimension. The light is forced to go anywhere the fiber is going. Optical fibers are ideal for communication; most of the internet is made of fiber optics. We will see later that fibers can also be used to create black holes made of light. All we see is light, and light is a wave, an oscillation racing through space. Imagine light like sound: in sound the tones we hear are vibrations of various frequencies, in light they are the colours we see. Each pure colour belongs to an oscillation of specific frequency. What makes a human body visible? Is it the material we are made of? Not quite! Most of the visibility comes from the scattering of light. Let me explain: we are made of many microscopic cells. Some cells contain pigment, so they are visible, because they absorb light. The hair colour, for example, is the colour of the pigment. Without pigment hair is white. Bones are also white. But what makes the whiteness? Why, apart from pigments, are we not transparent? The answer is that the interfaces of the many cells scatter light. They reflect light a myriad of times in many different directions. In the end the light becomes completely scrambled and diffuse - white. If one could remove the cause for reflections, the cells would become transparent. Reflections are caused by sharp interfaces between materials with different speeds of light. For example, in water the speed of light differs from the speed of light in air by a factor of about 0.75, so the water surface may reflect light. A metal mirror also has a refractive index very different from air, and so it reflects. If two materials let light move with the same speed, they are optically indistinguishable and do no longer reflect light. They are completely transparent. The Invisible Man in Herbert Wells' novel has made himself transparent following this recipe: he invented some substance that gave all the cells of his body the same refractive index. In this way he removed all causes of reflections, which made him completely transparent. Simple, isn't it? However, for the Invisible Man to disappear in thin air, the cells of his body need to have the same optical properties as air, which is very hard to achieve. Kathy Elbaz, the curator of the museum, has a different recipe for invisibility. She made herself to appear completely flat, which is possible. Recent experiments have demonstrated this effect on objects the size of a paper clip (not on humans yet). The Earthquake has shaken up things; the animals and plants in the laboratory have lost their camouflage. This shows how common camouflage is in nature and also how simple it often is. Even the master of camouflage, the octopus, has just a few tricks up his sleeve. The octopus can change the pigments of the skin very fast, adjusting to the colour of the surroundings, but it uses only three patterns: uniform colour, small structures and large disruptive structures. Nevertheless the combination of colour and simple structures can be extremely effective. The infatuated fish in the aquariums show how to make things invisible. The big fish in the middle prefers to remain hidden. He achieves this with a clever trick - by bending light. The aquariums around him are arranged in the right way to do this correctly. Here is why this works: all the images we see are carried by light. If light is bent around in the right way, we would see the background scenery and the small fish behind the big one, but not the big fish himself. So if you want to make yourself invisible just bend the light around you. Then nobody would see you and also nobody would see there was something to be seen. You create the perfect optical illusion. Yet how can one bend light, you may ask, doesn't it always go straight? No it doesn't. For example, light is bent at the water surface. If you look at the red fish in Matisse' painting (poisson rouge) they are not where they appear to be. This is because the water surface bends the light that carries their image. But why does this happen, you may ask; both air and water are transparent, why doesn't light go straight through? There comes an idea that shows an even greater magic than invisibility. It is called Fermat's Principle. Air and water and any other transparent materials change the speed of light. Mostly they make light a bit slower. Air does it just a little, water slows down light by 25%, glass by 33%. Fermat's Principle says that if light goes from one place to another, say from A to B, it does so in the shortest time possible. Light optimises its traveling time. So if the speed of light changes, light will bend to make it as fast as possible from A to B. So to make yourself invisible you need materials where the speed of light changes in a certain way. Yet think about Fermat's Principle and pause for a second. It makes light bend, which is important in all sorts of practical applications. Take, for example, fiber optics (the entire internet is made of optical fibers). If you bend a fiber the light in it bends with it. Fermat’s Principle describes how the fiber guides light. But there is something deeply mysterious hidden in Fermat’s Principle. If light goes from A to B it does so in the shortest time. You may ask, how does light know in advance that when it starts out in A it arrives in B? How can it know its future, its fate? How can light adjust its path before it has traveled it? Isn’t this something truly astonishing? For nearly 400 years many of the best and brightest scientists have been puzzled about it. We have some explanations now, but the magic has not completely disappeared. The eyes of the invisible man are visible. Why? In order to see, eyes need to turn light into nerve signals, and for this the light needs to be absorbed there in the first place. All this is, because everything we see is carried by light. Light contains all the images of the world. People did not always know that, many thought seeing is sending out rays for capturing images until, about a thousand years ago, Alhazen proved that seeing means capturing light. Seeing is retrieving. But how get the images into the light? The chameleon shows how this is done. The particles in its skin - pigments and sophisticated nanocrystals - scatter light coming from light sources, the Sun or artificial lighting. White light consists of many colours. Some of the colours are scattered more, some less at each patch of the skin, which creates the chameleon's colouring you see when you look at it. This is true for all sorts of creatures and things; what makes them visible and gives them colours and shapes is the ability to scatter light. In the first episode, you have met the characters of the story, here is some information on the character of the science behind it. The area of the science of invisibility is the science of light: optics. Optics describes how we see, why we see and what we don't see, and it tries to answer the question of what light really is. These cartoons are on the light side of the science of light, but they have a serious background that, step-by-step, will be explained in the notes to them.